*HOT* Possible FREE Huggies Diapers at Walgreens! If you have a little one in diapers, run to your local Walgreens store and see if you can score the following deal! 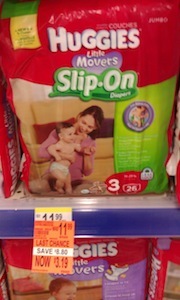 Some Walgreens stores have Huggies Little Movers Slip-On Diapers on clearance for as low as $3.19. There’s a Walgreens coupon inside the monthly coupon booklet that makes these FREE! The store coupon will adjust itself down automatically, so don’t worry about a beeping register. If you are able to get this deal, please leave a comment and tell us where you’re located! 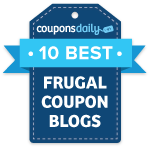 Check out more Walgreens deals. Yes they have the clearance tag out in Eastern, MA, but they were out of the diapers. It’s only size 3 and the woman working said the employees snagged them all before anyone else could. Do you have another Walgreens nearby that might have some left in stock? You could call them first before making the trip.